The tropical red shades of the Balmain Spring-Summer 2017 Womenswear collection were the inspiration for this season’s limited edition Hair Barrette. 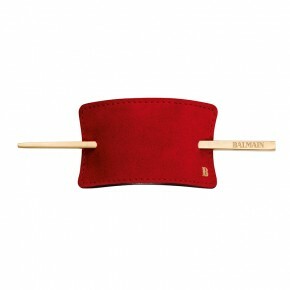 The Hair Barrette, made of genuine suede, is designed with a 14k gold plated hairpin with engraved Balmain logo. Perfect to add a touch of class to any hairstyle. Content: Genuine red suede Hair Barrette, 14k gold plated hairpin, black velvet Hair Barrette pouch, elastic band and bobby pin. Inspired by the Balmain Spring-Summer 2017 Collection. - Comb your hair to the back and make a ponytail. Take the elastic and put it an extra turn around the ponytail. Take the Hair Barrette and pin it across the scalp. Use it as a finish for updo’s. - Comb the hair to the back and make a ponytail. Use Styling Gel Strong or Silk Perfume to create a high gloss finish. Place the Hair Barrette over the elastic and secure with the 14k gold plated hairpin. The Hair Barrette perfectly adds a touch of class to all ponytails and up do’s.